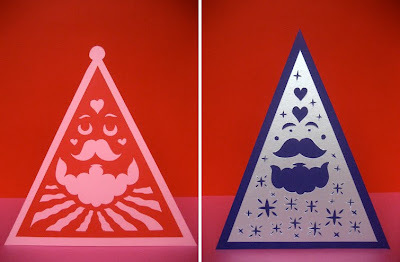 Some super fresh Christmas themed papercuts from Pinky have just been added to the Pinkyvision website, as well as soon new screenprints. All hand-made and signed these Papercuts are unique affordable collectors Items, the new collection can be viewed here. All purchases will be posted Special Delivery in time for Christmas, Yeah. The Mangle market will also feature the works of 35 other artists artists and designers including prints, jewellery and clothing, by Mark Pawson, Tatty Devine, Ryantown, Nervous Stephen, Peepshow and others.